We provide a karat scrap calculator for shipped karat gold. Your karat gold is always considered and paid as plumb gold .417, .585, .750, etc. And we never deduct for after melt weight loss. Approved accounts can simply enter current spot and dwt of each karat to see estimated settlement. On average, karat scrap yields about 98% of after-melt assay and weight. For your raw materials — bench sweeps, buffing dirt, etc., we process and pay on the assay. 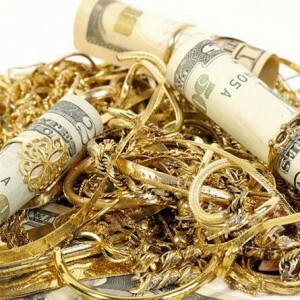 Karat gold, silver and platinum scrap is processed and paid within 24 hours (occasionally same day). SHR’s Refining of Bench Filings is as follows: Au is 98% Payable, Ag is 95% Payable, Minimum Treatment Charge is $100 for Au $50 for Ag. Bench Filings take approximately 1-2 weeks. We do our best to give your lots the highest priority when we receive them. SHR’s Refining of Sweeps, Polishings & Buffings is as follows: Au 95% payable, Ag 95% payable, Minimum Treatment Charge is $200. Polishing dirt takes approximately 4 weeks. sell them. Treatment charge for stone removal is $1.50/ troy oz and $175 minimum. Dead Watch Batteries are processed within 24 hours. We separate lithium and non-silver oxide batteries and safely dispose of them for you as well. SHR pays 1.5x silver spot. We also reimburse your flat rate shipping on lots containing 3 pounds or more. Gold-filled jewelry is paid at 95% with 5-pound minimum required for this type of low-grade smelting. Treatment charge is $0.35/t.oz. Refining fee for after-melt Au is $5/t.oz, and after-melt Ag is $0.50/t.oz. Please allow 4-6 weeks for smelting completion and settlement.